Things have transformed. Just two days after Justin Trudeau's cabinet was sworn in, it's become a different world for a political reporter. And the civil service is behaving differently too. Things have transformed. Just two days after Justin Trudeau's cabinet was sworn in, it's become a different world for a political reporter. And the civil service is behaving differently too. Friday morning, CBC News heard that there was an orientation meeting for new cabinet ministers in Ottawa. After some snooping around, a crew ended up at the Lester B. Pearson Building on Sussex Drive, home to offices for the Foreign Affairs Department. Confronted by security, crew members fully anticipated they would never make it past the gatekeepers and pondered saying they just wanted a muffin from the cafeteria. Instead, the crew was truthful, we identified ourselves as working for CBC News and said we were going in to wait for a meeting to end. The security official spoke into his sleeve and then said: "Go ahead in." We went inside and someone else asked us what our business was. We said confidently that we were there to wait for the meeting to end. We were then directed by a pleasant official to the comfy couches in the lobby. Soon a friendly bureaucrat approached us, introduced himself and asked if we had everything we needed. Then two more officials gave us their business cards. This was not the usual reception. But then something truly unexpected happened. Word went out that ministers would be making a statement about U.S. President Barack Obama's decision to reject the Keystone XL pipeline, which would have carried oil from the Prairies to Gulf Coast refineries. But it wasn't clear who would be doing the talking. Dozens of staffers lined the conference hall. They were mostly women, all holding their smartphones at the ready. 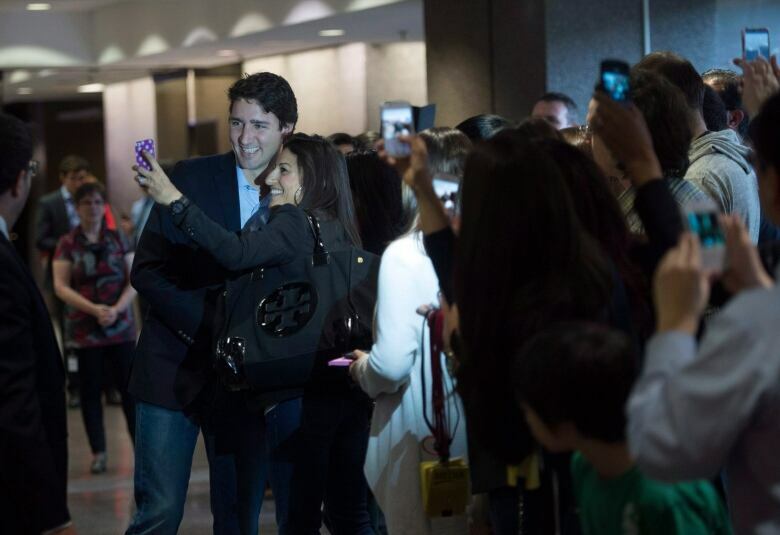 They were waiting to see Prime Minister Justin Trudeau. Several cabinet ministers left the meeting. Justice Minister Jody Wilson-Raybould was hugged as she made her way out. Defence Minister Harjit Sajjan, Agriculture Minister Lawrence MacAulay and Science Minister Kirsty Duncan left too. They were all cheered. Foreign Affairs Minister Stéphane Dion went to the microphone to answer questions from reporters. At one point, a reporter asked why some women in cabinet were making less money than their colleagues. Dion said that wasn't the case. "They are full ministers. They will work with us," he said. Dion answered a few more questions. Then he left. The crowd of assembled civil servants waited some more. Suddenly there was a buzz and the crowd moved forward. Trudeau appeared and began to make his way out of the building. He was swarmed. Many took photos and even selfies along the way. The prime minister was hugged. Cheers erupted. He smiled, waved and stopped by the door. He thanked the crowd for supporting the members of his cabinet, who had just left. Then he continued: "We're going to need every single one of you to give us, as you always do, your absolute best." They applauded and cheered some more. Some yelled back: "You've got it." One longtime staffer nearby said he'd never seen anything like it. Not in all of his years. And it might not be the only instance of a crowd forming to welcome a minister Friday. On Facebook, a photo circulated of civil servants at another location waiting to greet Sajjan.